If you take your car VIN number to the dealership they can cut you a key for your car without the master key. "If in doubt flat out"
Nice I have the same as yours ,black 2001 I wonder if we need transporter for the key. Cuz that one is non- transporter key. Did you mean transponder? The keyless entry is separate from the key itself, so I don't believe it is a transponder. That's what I like about these cars...its before the advent of extraneous digital gadgets like that, a very analog car! Picked up a set of Lloyd mats and a replica v6 lip! Admittedly I wanted an OEM one, but $320 from Rallispec is a bit much. I'll admit it was a bit nerve-wracking taking sandpaper to a nearly new exhaust, but I'm painting it black with VHT exhaust spray to give it a more OEM style look. 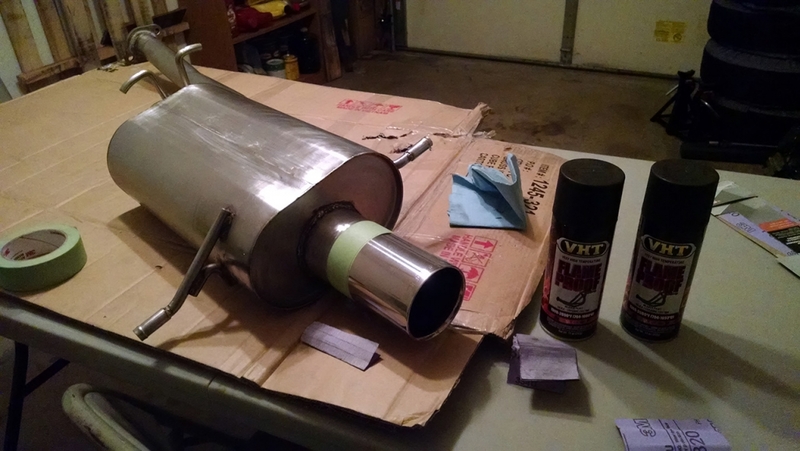 The worst part was getting the line straight on the exhaust tip itself with the tape, and sanding that line just next to the tape. I wanted to paint over that weld spot as seen on many other exhausts that have black boxes and such. Thanks to Rob (Uni98RS) for the exhaust at a great price! Ooooo I bought mine at 58k. I had all sorts of bad luck with mine, I hope you do not experience any of that!